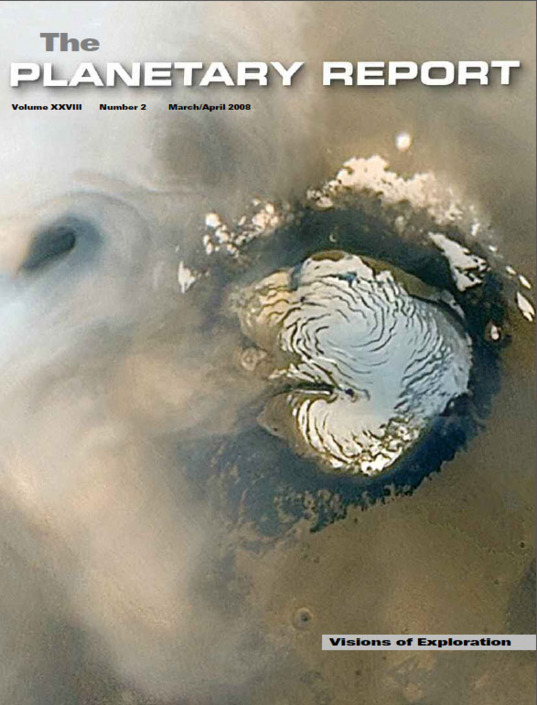 On the Cover: This mosaic of Mars' north polar region is composed of wide-angle camera daily global mapping images taken by Mars Global Surveyor in October 2006. The polar cap is visible at center right, and two annular (somewhat circular) clouds are visible at upper left. Annular clouds are common in midnorthern summer in Mars' north polar region, and they may be from eddy currents in the lower atmosphere. Although most of Mars is dry, its polar regions are rich in water ice. Phoenix is on its way to study the structure, composition, and chemistry of soil and ice samples near the Red Planet's north pole. 4 Opinion—On the Road to Mars: Three Stepping Stones and a Stumbling Block: Robert Farquhar looks at how best to get humans to Mars. 10 A Message to the Future: Visions of Mars: Peter Hollingsworth Smith describes the Phoenix mission and its goals, and hopes of reaching into the future. 14 Annual Report to Our Members: Dan Geraci looks back at the year in numbers and milestones passed. 15 Q&A How much of Pluto will we see with New Horizons?